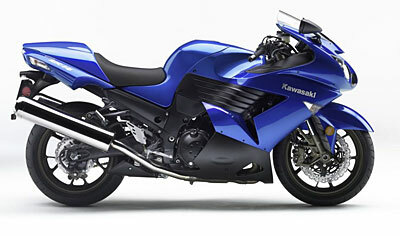 The Kawasaki ZX-14 motorcycle is the standard bearer of the Kawasaki motorcycle range. The ZX-14 is the most horsepower-laden Kawasaki ever produced, and was at one time the fastest production motorcycle in the world. Kawasaki claims this new version is "the quickest and most powerful production motorcycle". Since the ZX-14 was introduced in 2006, this beast has dominated the open-class sportbikes, and the superbike technology has manifested itself in the street-legal version seamlessly. Pure horsepower is synonymous with the ZX-14, but this animal is much, much more than just a power unit! The ZX-14's 1352CC, four-cylinder, DOHC engine produces incredible torque and power without affecting the handling properties, which is no mean feat of engineering! Its hats off to the designers at Kawasaki for their creative imaginations. To meet the growing level of noise regulations, Kawasaki took a look inside the engine and reduced the sound in the engine at its source rather than trying to beef up the exhaust system, which in turn leaves a more free flowing route for the exhaust gases! Very ingenious. Kawasaki claims the net result is an overall power gain from the unit! The ZX-14 has also managed to become more environmentally friendly, by adding a third catalyzer which reduces emissions and goes a long way to meeting the ever-growing emission control laws. Of course, you have to put the engine somewhere on this bike, so let's get to the frame of the Kawasaki ZX-14. The ZX-14's aluminium sections of its frame have been produced using gravity casting in the past, but nowadays Kawasaki have switched to die-casting, a process which helps to produce a lighter frame. It's monocoque design is, as always, very light and very strong. This motorcycle uses true ram-air induction, by taking the air from the center of the fairing to the airbox, again an approach designed to optimise the power output. The handling on the Kawsaki ZX-14 is superb, with the rear suspension using Kawasaki's 'uni-trak' design, helping to drop the center of gravity by lowering the weight within the chassis with bottom-link design.